Stowarzyszenie Młodej Polskiej Emigracji | POLISH BREXIT WATCH: Warsaw, the city for young and beautiful only? Warsaw, the city for young and beautiful only? Something strange happens in Warsaw. Looks like Warsaw's officials tend to turn this about 2-million capital city of the one of the biggest economies in the European Union into a city you just use for a while on a path of your career? And not into a city you want to live always? 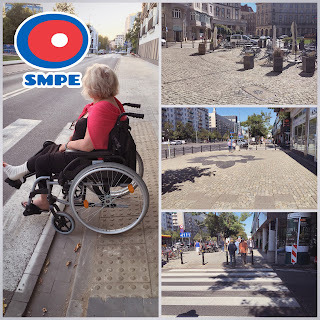 Hard to imagine over 70-years-old lack of possibility, for disabled, to cross the very main street in the very centre of Warsaw, the Jerozolimskie Avenues, almost a mile long - between Krucza Street and Starynkiewicza Square. Today it is possible i.a. to the official protest we exposed in September 2016. However, still a lot to do in front of just human access equality in Warsaw, PL. One of Polish cities - Kalisz, has just banned the sett pavements. They have realised Polish society isn't young-and-beautiful one only. We've got one of the lowest rates of working people in the EU. Many people retired years ago, a lot of them are disabled. So, why Kalisz keeps up to date like London but Warsaw doesn't? There is a good historical background but is it really worth to be kept over the city experience of today's inhabitants? It's worth to mention what you have to be ready for if you want to get from Warsaw's city centre to the most beautiful park in Warsaw - the Łazienki, via Marszalkowska and Bagatela Street. Saviour Square for a wheelchair user can be a challenge. But the sett isn't the worst you can experience on a wheelchair while sightseeing Warsaw today. The most tricky are relatively narrow but very dangerous water sluices located directly by the Warsaw's streets. If front wheels of your wheelchair are quite small, don't try to cross them without stop and go. In case you are in a hurry, you can experience what one of our members did: her wheelchair's front wheels got stuck in such a sluice and she fell out of the wheelchair. Such things can't happen in the EU, can they? Warsaw is for everyone, not only for young and beautiful, isn't it? So, why for havens sake they do take place yet?